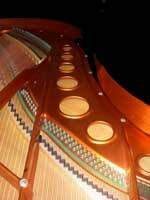 I offer a professional, high quality but affordable service, whether you require a domestic tuning, the complete reconditioning of a concert grand, or anything in between. My policy is to be scrupulously honest with my customers as to how much work their piano requires, and whether it is justifiable in the context of the age, condition and value of the instrument. I operate a pricing structure where a basic tuning in the Brighton and Hove area is a set figure (currently £70.00): further afield, as the travel time and mileage increases, so does the charge. Regulation and repair work is charged at an hourly rate which I always estimate before starting. For reconditioning work a thorough inspection is undertaken before an individual quote is provided; with no 'hidden extras'. 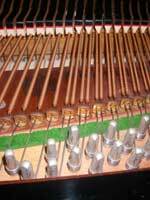 Minor adjustments are carried out free of extra charge in the course of a tuning. I will travel anywhere in the world at a negotiated price; I enjoy my trips to Hong Kong, Madeira, Oslo, Copenhagen, Scotland and Brussels, but am just as happy to walk down the road to my local customers. Please call or email to discuss your piano.